This article will reveal SUPERAntiSpyware and WiperSoft main pros and cons. Both anti-malware applications are introduced as effective tools against various types of malware, including spyware, ransomware, trojans, potentially unwanted applications (PUPs), annoying adware, and other cyber threats. So, if you are trying to decide which one of them would be a better choice, this article is for you. SUPERAntiSpyware is an anti-spyware application that was developed by a cybersecurity company SUPERAntiSpyware. The company specializes in security products and provides protection software for individual users and businesses. The company provides security solutions for small businesses and bigger enterprises. SUPERAntiSpyware was introduced for the first time in 2004 in the USA. 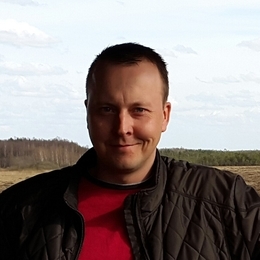 Today the company focuses on modern and innovative technologies that detect and removes malware infections and prevents computers from malicious software. SUPERAntiSpyware provides protection against online threats including malware, spyware, adware, Trojans, dialers, keyloggers, hijackers and worms. The most recent version of the anti-malware application SUPERAntiSpyware Version 6.0 combines a new simplified interface, touch screen capability, system investigator and more. SUPERAntiSpyware offers two versions for its home users, including a free version which scans the computer, and a premium version with additional features. The company also has a 30-day money return policy, for those who are not sure whether the software will be the right choice for them. The software was tested by researchers at Reviewed by Pro for seven days, on Windows 10 PC. Researchers noted that the download and installation processes are easy and take only couple minutes. The anti-malware application supports Windows operating systems, including Windows Vista, 7, 8, 8.1, and 10. SUPERAntiSpyware provides users with quick scans. SUPERAntiSpyware does not have a negative impact on the system and does not slow down the computer even during scans. Low budget anti-malware application is good for those, who do not want to spend much on security software. SUPERAntiSpyware combines many useful features including real-time blocking and scheduled scanning. If you do not have the newest PC with the most recent specification, SUPERAntiSpyware will run on your PC because of its’ low requirements for the system. The anti-malware application has a pretty confusing user interface which also looks outdated. When it comes to malware detection, the software has detected legitimate programs as malware, and the actual malware detection was lower than the market average. According to the current users, the anti-malware application is not capable to cover a PC’s security completely, so for those who want a complete protection, additional products are required. Researchers provided a final verdict. The anti-malware solution is not expensive, however, it has lower than average malware detection rates. When it comes to the second solution, WiperSoft, the software was developed by WiperSoft LLC. In comparison with SUPERAntiSpyware, WiperSoft is very young software and was introduced in 2015. WiperSoft was developed in order to deliver advanced malware detection and removal features, in an easy to operate user interface. WiperSoft is a fast solution to all PCs’ issues and cyber threats that possibly can pose. 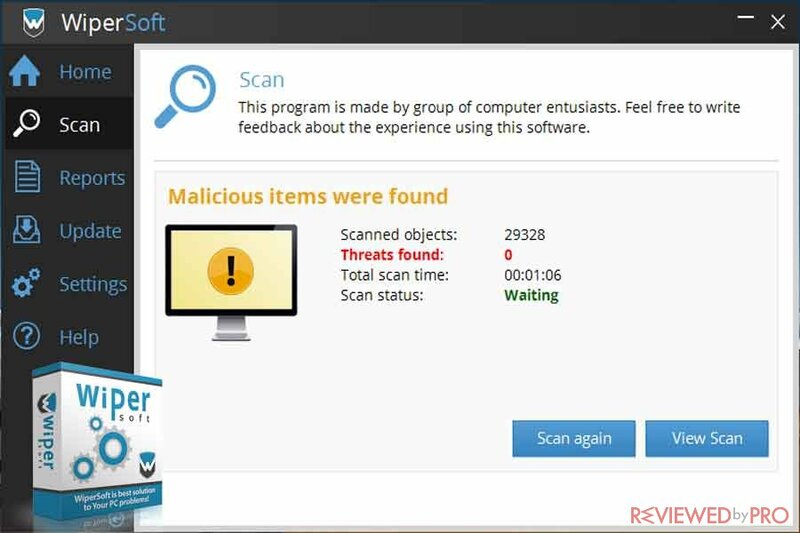 The anti-malware tool provides quick scans that easily detect unwanted and malicious applications, including malware, browser hijackers, adware, toolbars and other software that was installed without user permission. WiperSoft, just like SUPERAntiSpyware, provides users with free and paid versions of the security. With the free version of the software, users receive privacy protection features, spyware detection, and free scans. Meanwhile, the paid software provides a full range of features, including malware removal, free technical support, free custom fix feature and more. The software was tested by researchers at Reviewed by Pro for 30 days using the Windows 10 PC with 8 GB of RAM and HDD. The download and installation of WiperSoft are simple and does not take long. 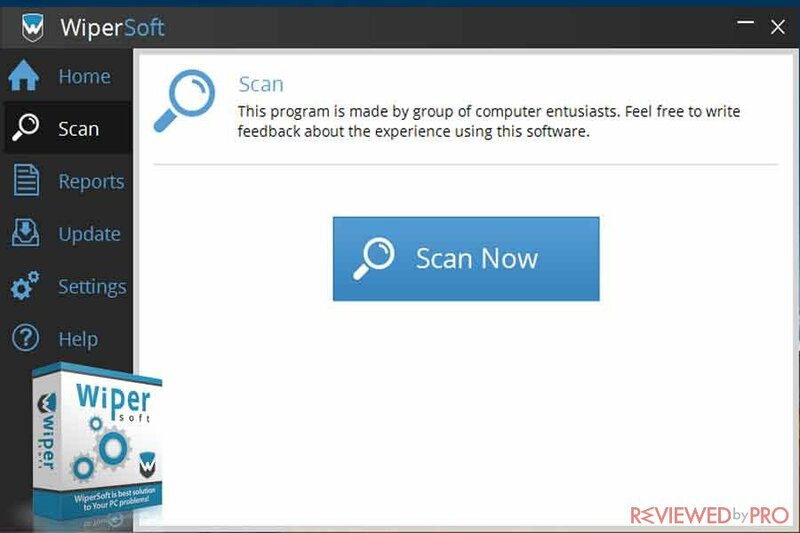 After the installation of WiperSoft, it scans the system automatically, and there is no option to skip this scan. The first impression of the software was good because it did not slow down a system, even during the scan. It works quietly in the background and does not interrupt any system performances. WiperSoft is a very quick software. Indeed, the full scan was completed in about eight minutes which is very quick, compared to the market average which is about 30 minutes. WiperSoft successfully detects small infections and remove them with a single tap. WiperSoft is easy to operate due to the simple user interface. WiperSoft is not capable of finding bigger infections, even though smallest threats were detected easily. The anti-malware solution wouldn’t be able to successfully protect businesses or heavy users. WiperSoft has only one full scan, while other programs usually offer several scan modes. After the test, researchers came up with the final verdict. Although WiperSoft is very simple and fast anti-spyware software, it left us with many disappointments because it is not effective against bigger threats and is quite expensive. WiperSoft anti-spyware would not be capable of protecting bigger businesses or heavy users of the Internet, but it could be great for casual everyday Internet users. WiperSoft is a simple and fast application, however, it is not as effective as it was expected. SUPERAntiSpyware and WiperSoft offer users similar features and average detection rates. When it comes to efficiency of the software, WiperSoft would be a good solution for everyday use, and it also has simple and easy to operate user interface. However, WiperSoft is not capable of protecting heavy users or businesses. SUPERAntiSpyware offers a better price, than WiperSoft, and slightly more features, but it does not cover all of the PC’s security, so if you choose SUPERAntiSpyware, you would need an additional antivirus product. To sum up, WiperSoft would be a better solution for everyday use, as it offers better detection rates and easier to use interface, compared to SUPERAntiSpyware. ^ Olivia Morelli. 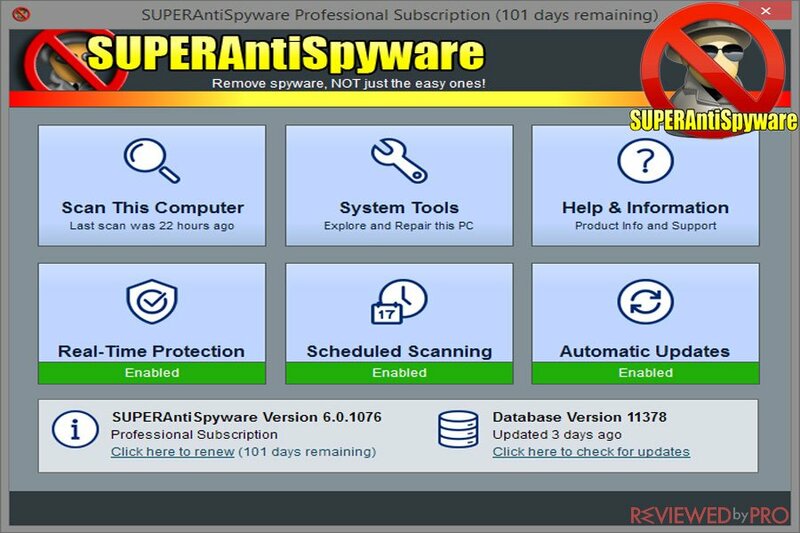 SUPERAntiSpyware review. Reviewed by Pro. ^ Alice Woods. WiperSoft Review. Reviewed by Pro. This entry was posted on 2018-02-27 at 10:11 and is filed under News.